This is a book I have been meaning to read for a while. Whenever a book is made into a movie, I feel honour bound to read the book first. Otherwise I would probably never bother reading the book. PRN won a Newberry medal for this book, so I thought it would be a nice story. I wasn't disappointed. The book is about a boy named Marty who reminded me a lot of Jesse in Bridge to Terabithia. Marty is eleven, has two younger siblings, has a family who are short of cash and seem very busy just making ends meet. Both stories are set in a poor rural area. And like BTT, this story is a real tear-jerker. The characters in Shiloh speak in West Virginia slang, which takes some getting used to. A scruffy, underfed beagle follows Marty home one day. Marty knows who owns it, but can't bear the thought of returning the dog to a home where it is unloved and unappreciated. He knows the owner, Judd, has already shot one of his dogs in the head. Marty hides the dog, who he names Shiloh, in a run up behind his house. He needs to lie to his parents and steal food to feed it. Shiloh is the perfect pet, being fully appreciative of Marty's efforts. Sadly, one night another dog gets in to Shiloh's run and savages him. Marty has no choice but to reveal Shiloh and take him to the local doctor who stitches him up. The whole family end up falling in love with the pup. When Shiloh's owner finds out, Marty has to work out a plan to buy Shiloh. He sets out on his own to bargain with the red neck and finds him armed and dangerous. I enjoyed reading this book. I liked the way it dealt with the issue of telling the truth. Is it always the right thing to tell the truth? What if telling the truth results in loss of life? Is it worth it to lie to save someone you love? I also really liked Marty who was such an animal lover that he couldn't eat his dinner unless he knew it had died quickly. 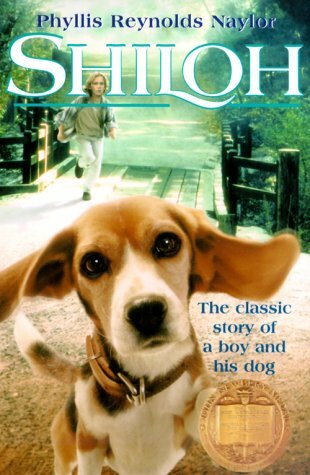 Shiloh is recommended for lovers of sad dog stories, aged ten up.